Allan and I were married on August 22, 1986 in the right place, and in the Lord’s time. I was 28 years old when we began our journey together. We wanted to havea baby as soon as possible and did nothing to avoid starting our family. In the fall of 1987, our wish came true, but it was short lived when I miscarried at 3 months. I never dreamed that that would be the only time I would become pregnant. Allan got deathly sick in 1988 and almost died from complications of Pancreatitis with Pseudo Cysts. After 3 major surgeries and months in the hospital, we finally could live a normal life. to Mohave County, Arizona, then on to Graham County and my home town of Thatcher. For 11 years we tried every option of having our own child. Feelings of anger, betrayal, sadness, failure, bitterness, and anxiety, filled my soul for years. Every time a friend or relative shared the news that they were going to have a baby, I felt denied. I was so happy for them, but deep inside, my heart was aching. I felt my prayers were in vain, that Heavenly Father had forgotten about me, that I didn’t matter to Him anymore. searching for unanswered questions. I figured that was where I could find peace and solace to calm the ache in my heart. For some reason, I felt closer to Heaven when I was there. I poured out my soul and shed many tears on those visits. I pleaded and bargained with Heavenly Father to please let me be a mother. It was my greatest desire. I promised that if He would send us a child, I would raise that child to walk uprightly before Him and that I would make sure that child knew they were His child. The answers came. We knew we would never conceive a child of our own, so we started the adoption process through the LDS Church Social Services. The long process was completed late in 1996, and we were finally certified to adopt in the State of Arizona. The waiting list was long, and I didn’t have much hope. I was used to all those feelings of disappointment and prepared myself for the worse. However, despite my doubts and fears, Heavenly Father knew the desires of our hearts and had a plan for us. In June of 1997, out of the blue, we received a phone call from a very dear friend of ours. She told us of a young girl who was in trouble and wanted to give her baby up for adoption, and would we be interested in taking the baby. I stood there with tears streaming down my face trying to compose myself long enough to give her our answer. On October 13, 1997, a beautiful baby boy came into this world and made me a mom. When we walked into the hospital that night and saw this precious son of God for the first time, I knew instantly that Heavenly Father loved me, and He had answered my prayers. The pure joy that filled my soul cannot be described. Six months later, as Allan and I knelt at the altar in the Mesa Temple, and they placed Dallin on the altar to be sealed to us for all Eternity, Heaven was opened and the Holy Ghost bore witness to me that indeed Dallin was mine. He had to come to us in a different way, but he was ours forever. When Dallin was 2, he was in my mother’s bedroom, and when I went to find him, he was standing in front of a picture of my father and mother. He pointed at my dad and said, “Grandpa.” How did he know him? I had never shown him a picture of my dad, nor talked to him about his Grandpa Jones. 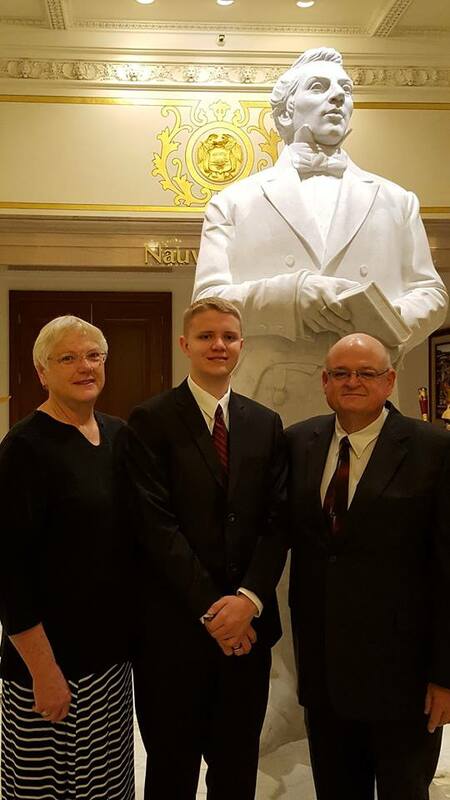 I truly believe that my father played a major role in the placement of Dallin in our home. They knew each other well, in Heaven, before Dallin came to earth. The time I spent pleading and praying in the cemetery, was not in vain. They heard me, not only Heavenly Father, but also my earthly father. The veil is thin and our loved ones are closer than we know. Of this I am sure. Salt Lake City. He knows who he is; he knows he is a Son of God. I am so glad I kept my promise to God, and He kept His. What a beautiful story! Thank you for sharing your testimony. Oh Kay, what a touching story! As a mother of three daughters who experience infertility I can relate to what you went through. Salon is amazing and so are you! Thank you for sharing your story.